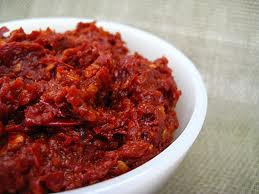 A great sambal recipe ! 1. Blend the first six ingredients into a paste. If they do not blend easily, add about 3 tsp of oil to the mixture. 2. Heat 5 Tbsp oil in a wok / pan. When the oil is moderately hot, sauté the paste until it is fragrant. This should take about 15 minutes. Use only low heat and stir the paste constantly so that it does not stick to the wok/pan. 3. Add the tamarind juice and the sugar. 4. Let the paste cook while stirring occasionally. It is ready when oil from the paste floats to the top. 5. Ladle as much of the finished sambal as you want onto your main dish. Let the rest of the sambal cool before storing it in meal-sized portions for freezing.